Hanging curtains doesn’t have to be a pain! Learn how to hang them straight — and keep the curtain rod from coming out of the wall! It’s been a little tough living in a renovation zone. Now that we’re down to the details, I love that I can start making things pretty again! This weekend I made Ryan take a break from the kitchen so we could hang curtains in our living room. I thought I’d take a few photos and write up a quick tutorial of how we hang curtains! First you want to figure out where you want your curtains to hang. I like them to brush the floor — no massive pooling on the floor and no curtains with short Urkel-Pants syndrome. But you can do what you want — they’re your curtains after all! I had Ryan hold up the curtains to see about how far down from the ceiling we needed to hang our rod. To get the curtains to brush the floor, we needed to hang the rod about 6″ below the ceiling. We also wanted the curtains to extend beyond the edge of the window. 6″ seemed about right here as well. If you have wider curtains and need more room to bunch them up when they are open, you might want to extend this length. Use your ruler or tape measure to find the location of your first hole. In our case, we measured 6″ from the window edge, and 6″ down from the ceiling and made a dot. If you have brackets like ours, you’ll have to take into account that the bracket slips over the screw and you’ll lose another .5″ or so of height when you hang the bracket. Move your dot up .5″ if this is the case. You’ll then need to figure out if there’s a stud behind the drywall where your hole is going to be drilled. If there IS a stud, you will just use a screw. Knowing which to use is very important — without a drywall anchor, a screw alone will not hold the weight of the curtain and rod. And if you try and use a drywall anchor in a stud, you’re just in for a world of frustration. The easiest way to find a stud is to use a stud finder. It will light up red if there is a stud — easy! If you do not have a stud finder, you can use a hammer and a nail. (Important — make sure the nail is smaller than your screw). When you hammer the nail into the wall, it should be fairly easy to tell if you’re hammering into stud (harder and makes a “thud” sort of sound) or drywall (easier and it makes a hollow sound). Once you’ve figured it out, pull out the nail. If you have a stud, drive the screw directly into the stud, and slip the bracket over. Two of our three brackets went into studs. If you have dry wall, you’ll have to use an anchor. There are two types of anchors — regular and self-tapping. A self-tapping anchor looks threaded, like a screw. A regular anchor doesn’t. If you have a self-tapping anchor, you can screw it into the wall just like you would a screw (though sometimes a pilot hole helps if it’s being difficult). If you have a regular anchor, you can drill a small pilot hole to get it started. Ours were self-tapping, so Ryan just screwed it directly into the wall. After your anchor is in the wall, you can then drive your screw into the anchor. It will hold much better than just the screw alone! Then drive in the bottom screw using the above method. You’ll have to pivot (PIVOT!) the bracket out of the way or remove it entirely and then replace it. A handheld screwdriver works well for the last few turns. 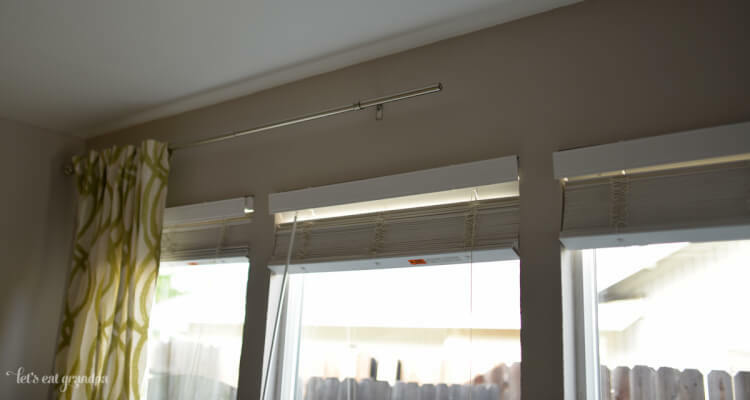 Once you have your brackets attached to the wall, you’re ready to hang your curtain rod! It’s easiest to thread your curtains on the rod beforehand. Our rod was quite long — it had two end pieces and a connector piece in the middle. We put two on each end. And it wasn’t long enough. Well, friends, you see — it turns out that 120″ is not, in fact 12′ long. I am no good at the mathing, apparently. We had 11′ of windows and only 10′ of rod. Well done me! Target didn’t carry a rod long enough, so we hit Home Depot for a longer rod that still worked with our mercury glass end caps that I love. 144″! 12′! Much better! We decided we could use the shorter rod in our guest bedroom, which still needs curtains. So it wasn’t toooo bad of a mistake. Moral of the story? Take a calculator with you when you’re buying things! I like to have one loop of my curtains on the outside of the bracket. It helps hide the bracket and it makes it easier to close the curtains. When you have the rod up and balanced, the brackets have a tiny tightening screw underneath. Hand-tighten this screw to secure the rod. And there you have it! You’ve hung curtains properly and they look fabulous. Don’t they? I also added our furniture back in, and I’m LOVING how our living room is coming together. It’s casual but a bit elegant. Still really comfortable and warm, even though I’m drawn to cooler colors. Our house is really becoming a home! Love your curtains, and what a helpful tutorial! I’m getting ready to purchase curtains for our currently open master bedroom windows (problem! ), and I’ve been trying to figure out if I want them to touch the floor or end at the windowsill. I’m leaning toward floor . . . and most of the curtains I’ve found online have been 84″ long, which would definitely be floor-length for us. Hmm . . .
Nice of you to do a tutorial. Your living room is coming together beautifully! I love your breezy curtains and the wall of windows. I can imagine just how lovely it will be when your garden space comes to life! I can’t wait for the garden! Unfortunately, it has to wait until next year. But it will happen! Love those curtains….great tutorial. The room came together beautifully too! I need to do this in my master bedroom! Love the name of your blog! Makes me smile! Did you do the design on this blog yourself? I love the clean with a touch of ‘feminine’ layout. I need to redo my blog and this is the type of look I am thinking about. Thanks! Me too — took me forever to find a pair I loved! Perfect timing for me to find this tutorial, as I’m about to embark on my own 12′ curtain hanging adventure in my room! Thanks Cori! 12′! Holy cow! You can do this! Love your curtains and the windows! Very open and airy. My living room windows are two large, almost to the floor old pane style. I hung the rod about 4″ from ceiling and they brush the floor without pooling. I think it draws the eye up and gives the illusion of a higher ceiling. I’d love to see how you place your furniture. I’m never happy with mine. Thanks??? ?